One of the first treats that really started my baking addiction was the classic peanut butter cup blossom. I can actually remember being very young and accidentally using 3/4 of a CUP of baking soda instead of 3/4 of a teaspoon in one batch. It’s safe to say that I’ve learned a lot about baking since that mishap, but I still have the cookbook with the original recipe I’ve always used! 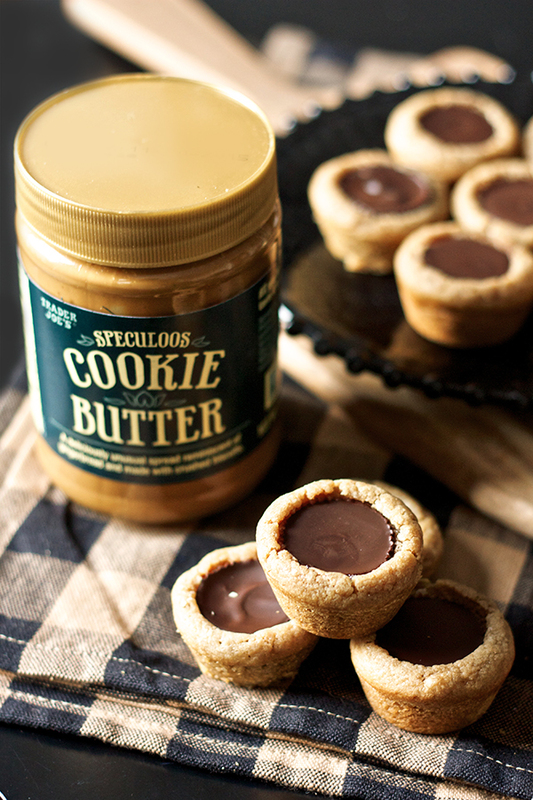 This past Christmas Ryan changed things up a bit by substituting the peanut butter for cookie butter (aka speculoos spread) and using dark chocolate cookie butter cups from Trader Joe’s to make them fully cookie-buttery. With the proper amount of baking soda, these cookies were definitely blog-worthy and they might just make the annual holiday baking list for years to come! The fact that these types of cookies are so easy to put together make them incredibly dangerous. I mean, if Ryan can pull off a batch with little help from his baking-obsessed wife, that says a lot. The man doesn’t get much of a chance to practice baking with me hogging the kitchen all the time! My favorite part of making these is unwrapping the chocolates as quickly as possible and popping them into the just-barely-baked-through cookies while they’re still super soft. It’s a race against the clock to get them all done before the cookies set! 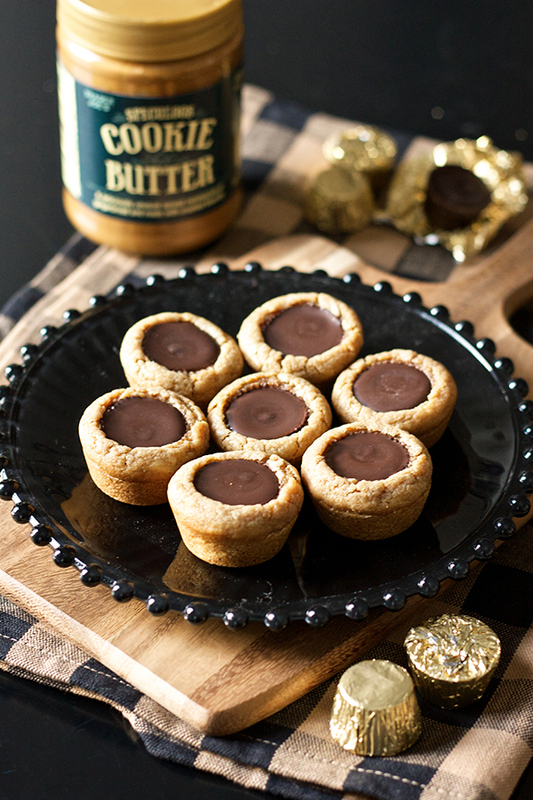 And another great thing about these cookie butter cups is that there’s only gold foil, no brown paper liner inside, so unwrapping is even easier than Reese’s. Trader Joe’s is making it almost too easy to cheat on Reese’s for these cookies – it’s an unfair advantage! If you’ve been a peanut butter blossom fan for decades like me, it may just be time to try out a new variety and shake things up a bit. We served the peanut butter version at our party as well and still love them, but I urge you to stock up at TJ and give these a try. You won’t be sorry!! 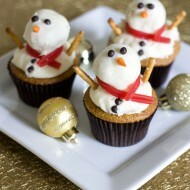 Preheat oven to 350 degrees and spray mini muffin tins with non-stick cooking spray. In the bowl of an electric mixer, beat together the cookie butter and butter until light and fluffy, about 2-3 minutes. Add the sugars and continue to mix until smooth. Add the egg, milk, and vanilla and beat well, scraping down the sides as necessary to combine everything together. In a medium bowl, whisk together the flour, baking soda, and salt. With the mixer on low speed, slowly add the dry ingredients into the cookie butter mixture until just combined. Shape dough into 1″ balls and place in each one into its own mini muffin tin. Bake for 8 minutes. 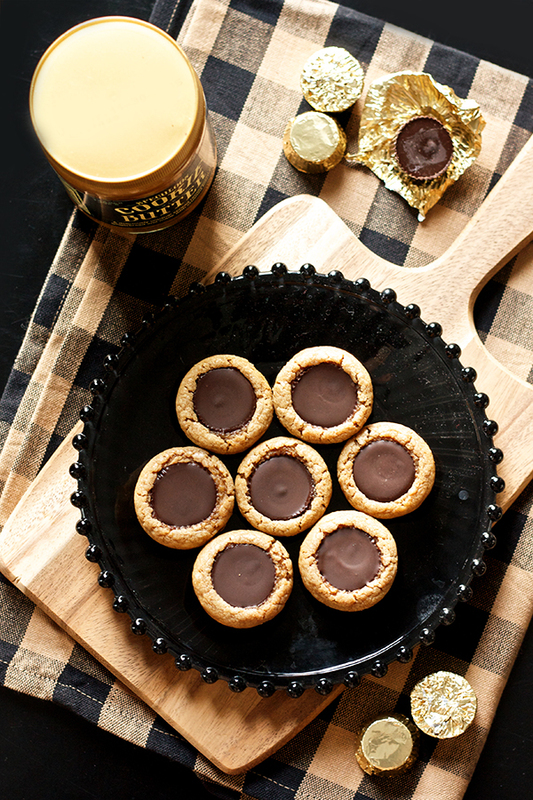 While cookies are baking, unwrap all of the cookie butter cups and have them ready to go next to the oven for right when the cookies are ready. 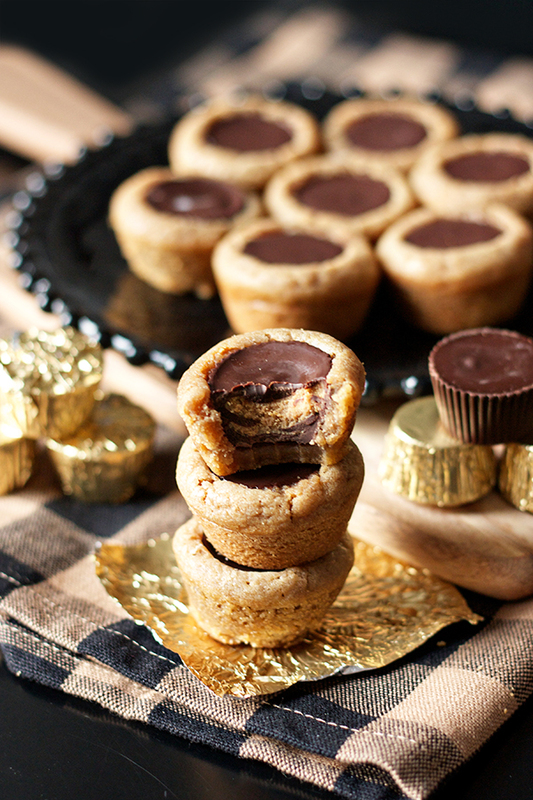 When cookies are done, press a cookie butter cup firmly in the center of each cookie. 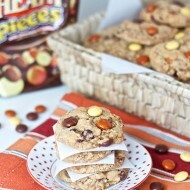 Let the cookies sit in the tin for 5 minutes before transferring them to a wire rack to cool completely. I recommend putting the cookies in the fridge for about 20 minutes after they've cooled to make sure the chocolate is completely set. 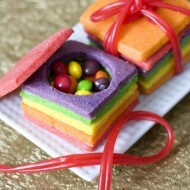 Since these turned out so well, we might just need a Ryan’s Sweet Tooth section sooner or later. Thanks for the great cookies Ry! Believe it or not I’m yet to try cookie butter!! This might be a great reason too!! Man I wish we had jars of cookie butter available in Australia so I could make these blossoms. I can imagine they are SO delicious and moorish! I love love love cookie butter. I think of it as the younger spicier version of peanut butter. So yes, we are definitely cheating ;) these look amazing. I love the photos too!